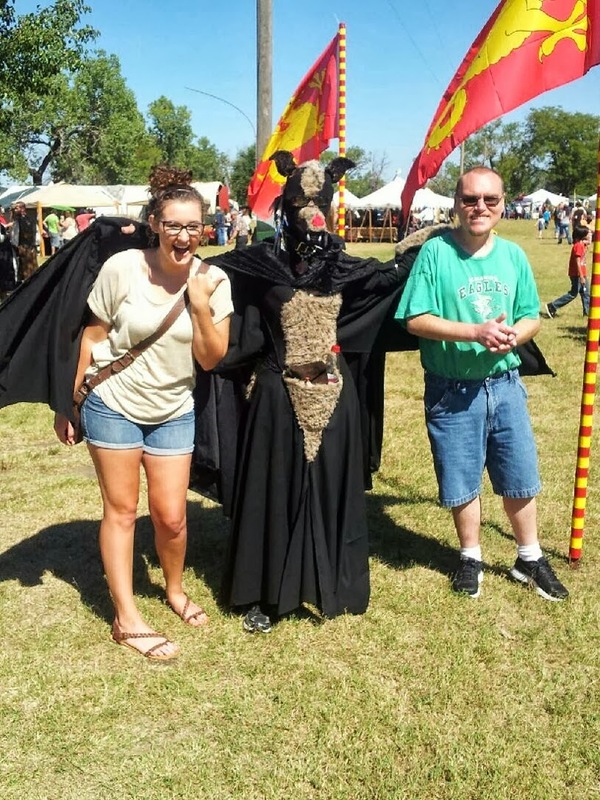 September 2013 – He Said What?! I was discovered! He clomped up the hall and began to tell me about his head and stomach hurting. His blood shot eyes also told a tale. Aaron has started a new medicine this week, and every morning he has gotten up early……..much earlier than usual, but this morning was way too early. Is it the medicine that is causing his sleep to be disrupted? Does he really feel sick? With Aaron it’s hard to tell because he tends to exaggerate aches and pains in order to either get sympathy or to be able to stay home from his day group. I ushered him back to his room while listening to him talk about not feeling well, and then he launched into a rundown of the latest movie that he’s watching. I told him to hush about the movie, helped him take his sweater off, pulled back and straightened his covers, and finally talked him into getting in bed again over his protests that he wasn’t sleepy. He kept talking. “Aaron, Aaron,” I said. “Just close your eyes and relax. Don’t talk anymore about movies or about your head or stomach. I bet you’ll go back to sleep.” He wasn’t sold on that idea, but I could tell that he liked the feel of his multiple blankets on top of his tired body and that he was indeed relaxing. I turned off his light and closed his door. It wasn’t long before I could hear his steady breathing through the monitor. Good! He had fallen back asleep. Hopefully he would stay in bed for a couple more hours, at least. It was just a little over an hour later, as Gary was getting ready to leave for work, that I heard Aaron stirring and soon he was downstairs. I waited in the kitchen to see what look was on his face…….what mood he was showing………when he came into the room with a smile. Ah, relief! He talked about not being able to sleep, about his head and stomach, and his movie once again……..but he was happy and I was hoping the pleasant mood would last. “Mom! I woke up at 5:09! Why couldn’t I sleep?” We talked about Aaron’s sleeplessness even as I reminded him that he did get an extra nap after he went back to bed. I wanted him to feel rested and not to claim extreme tiredness as a reason to stay home today. Soon I had talked him into eating some breakfast. I suggested boiled eggs and bacon, but he only wanted eggs. He finally agreed to the bacon if I would make it crispy and not chewy. Later he had his eggs and bacon along with his coffee as he was snuggled under his blanket watching a program on the DVR. What a life! Of course, the program he was watching was one that he started yesterday but he didn’t get to finish it. Therefore, in true Aaron fashion, he started the recording over from the beginning. He will NOT usually resume watching a program where he left off but will instead start all over from the beginning. Some programs take several times to watch because of this regimented way of doing things. He also presses the pause button every time he looks down at his plate to put food on his spoon or fork. He cannot miss one second of his program………not one. 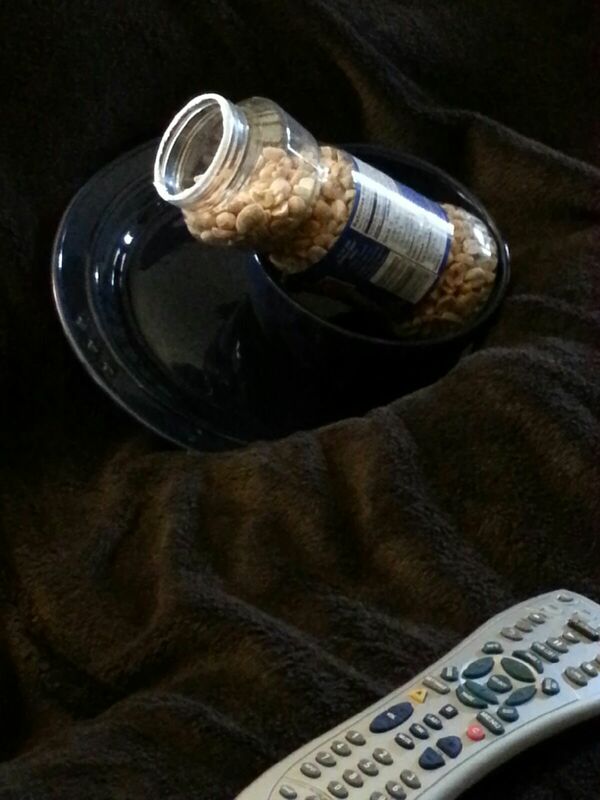 So it’s pause……scoop food……..look up…….press play……..chew and swallow……press pause…….scoop food………. I mentioned this to Aaron this morning in a very matter-of-fact way so that he wouldn’t get defensive. He confirmed that this is how he operates. I just agreed with him and walked back in the kitchen as I left him to his pausing and playing, over and over and over. There he sat, with his food and his multiple utensils and napkins and coffee………..with his particular way of watching his program………and his mother just smiling inwardly at this unusual son. I got our supper in the crock pot and cleaned the kitchen while Aaron finished his pausing and chewing and playing. He was very quiet, and I saw that his head was laying back though his eyes were open. He got a little grouchy when I told him that I was going to shower, and that he should do likewise. Later, I looked up the hall and saw that his door was closed. When I knocked and then walked into his room, I saw him sitting at his desk, watching a movie on his computer. Now his mood was different. He was grouchy Aaron, and he let me know that he wanted me to leave him alone. 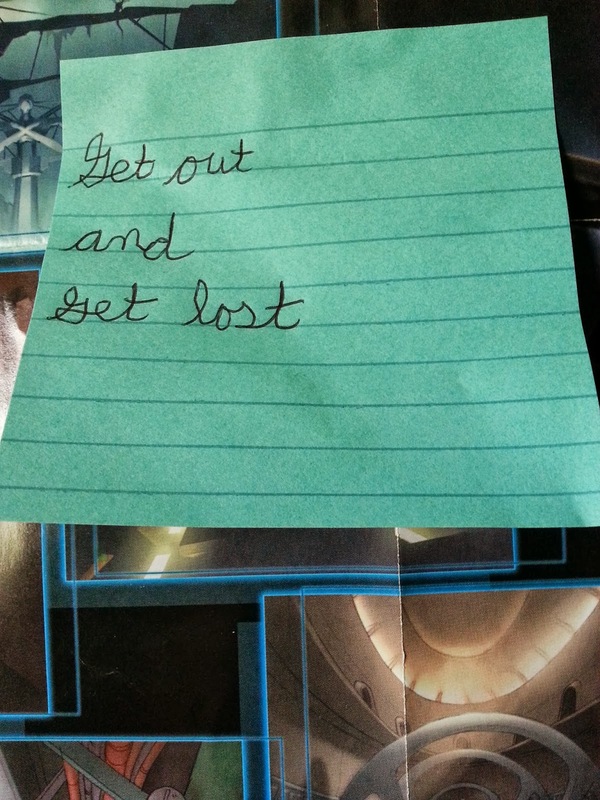 In fact, he took off his headphones and got up from his chair as he pointed to the sign that he had put on his door. He was quite irritated that I had not seen the glaring sign………..the sign that told me to not only stay out, but to get lost. Oh boy………here we go, I thought. So I just told him that soon we would be leaving, and then I left his room as he closed the door behind me. Surprisingly enough, the rest of the morning was pretty calm. He allowed me in his room a few more times………he gladly let me help him with his belt………he listened while I explained that his tiredness was not my fault……….and he actually got ready to leave for his group without a fight. Aaron played the part of being very tired as I conveyed to the driver that Aaron had gotten up at 5:09 and didn’t feel well, etc., etc. He was satisfied then, got in the van, and off they went. Off I went, too, driving to Sam’s and thinking of our morning. 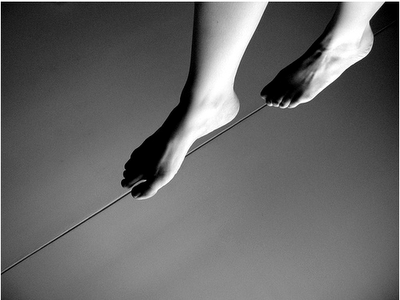 I feel like I am walking a tightrope nearly every day. Hearing that Aaron was up so early……..at 5:09! 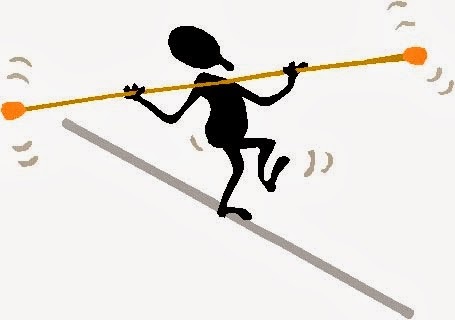 !…………..was how I started my tightrope walk today. One foot gingerly in front of the other as I heard him stirring and then as I went downstairs, hoping that he wouldn’t hear me. Silly me! Of course he heard me. I headed across my tightrope as he came out of his bedroom and as I helped him get back in bed. I was steady on the rope as I heard Aaron sleeping again, but I wobbled when he came downstairs an hour later. I kept my balance as I suggested breakfast and talked Aaron into eating something, and as we talked about his unique way of watching his recorded programs. Things got tricky when I mentioned taking a shower and getting ready. Then I really felt like I was going to fall off the rope when Aaron pointed me to his sign and abruptly shut his door again. Wobble………get my balance………wobble………..get my balance. Such is life with Aaron. I couldn’t completely breathe a sigh of relief until I was driving away after conveying his message to the driver, being sure I got the 5:09 part correct. This balancing act covers the complete spectrum of Aaron’s life………from serious new medicine issues and behavior problems and seizures………to whether he wants to eat a somewhat healthy breakfast or will refuse good food………to being told to stay out of his room. Always balancing our decisions about Aaron and our direction with Aaron, wondering if we’re going to fall off that rope at any given time. We balance our reactions to Aaron as well, struggling to be patient and loving while knowing at times that we need to be firm and strong. We balance our time spent with Aaron as opposed to our time spent doing what we want to do……without guilt. We balance whether to listen to Aaron’s same stories or same issues over and over and over again, or whether to pull the plug and tell Aaron that he just needs to quit telling us this same thing….AGAIN! And as time goes on, we will need to balance how to protect Aaron with how to release him. I’m just very thankful that we have God to steady us when we start going sideways. Thankful that we have good family and friends who give us love and support and advice and laughter. 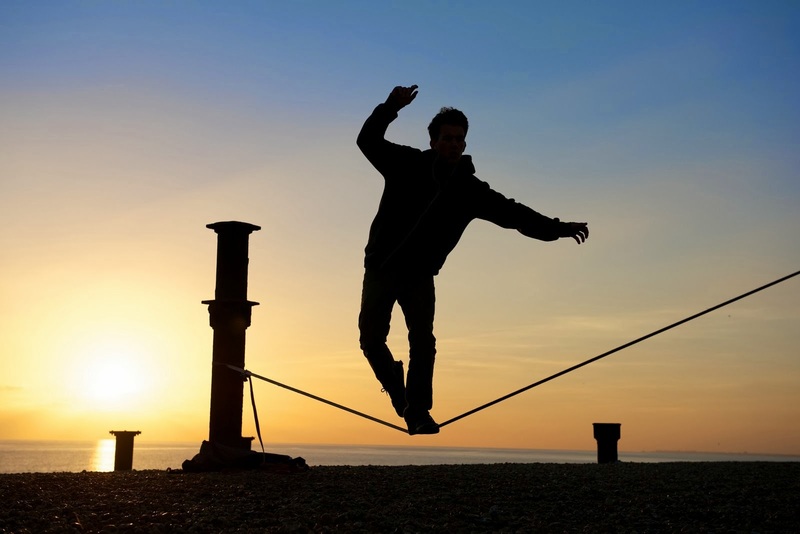 And very, very thankful that even if we do fall off the rope……….underneath are God’s everlasting arms to catch us and to gently lift us back onto the rope……….where we will once again put one foot in front of the other and once again walk this tightrope of life with Aaron. Gary and I just returned from a wonderful trip to Texas. We spent the weekend at the AAA Texas Nationals NHRA race at the Texas Motorplex…..where I went from being “Miss woman who likes to watch Andrew on TV” to being “Miss woman who likes to watch Andrew in person.” Aaron hasn’t thought to say that yet, but it’s probably just a matter of time before that comes out of his mouth in some form or fashion. We also finished the weekend perfectly by getting to have dinner with Andrea and Pete. Zach, whom we’ve known for years, came over to spend the weekend with Aaron. Aaron has, of course, talked and talked and talked about the weekend and all the fun they had. They went to Chipotle’s, which was new to Aaron…….and which he keeps calling by names like Alfredo’s and other Italian sounding names. He described what they ate and what it had in it and the soft shells and how it tasted……and that’s just one place that they went, and one thing that they ate. He has expounded on everything they ate and everywhere they went, trust me. He will continue to do so until every topic is thoroughly exhausted……….and Gary and I will be, as well. Of course, Aaron doesn’t care about that. I am sure that his favorite Bible verse, if he knew of it, would be, “He who has an ear, let him hear….” And to think, we have two. 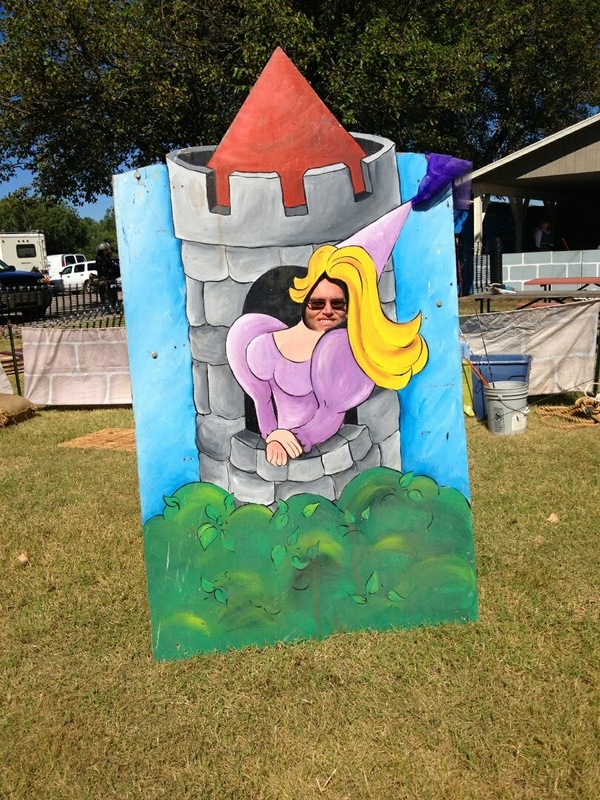 No, Aaron, I would not want to be a lady knight. “Oh yeah,” he replied. “I bet you’d like to be a queen.” Absolutely, Aaron! As Aaron crammed salad and pizza down for supper on Monday, he said to Gary and me, “I noticed that Zach talks like, ‘Cool dude.’ Why does he talk like that?” So we told Aaron that guys that are Zach’s age just talk like that. I know. We’re so profound. We know you’re not his brother, Aaron, but that’s just the way guys talk. Gary and I laughed at Aaron’s rigid predictability as he sat there trying to figure out this bro business. I will always be amazed at how Aaron notices everything……..absolutely everything. Like this morning. Aaron had been outside in the mulch as I finished getting ready to take him to meet his group. I heard the door slam shut as he came in the house. Perfect timing, I thought, as I hooked up his computer keyboard. He yelled, “Mom! I have something to show you!” He came up the stairs and in to his room just as I turned around………..and saw him right behind me, holding up a little baggie. And inside the little baggie was a little mouse………a live MOUSE!!!! Oh my word!! Aaron knew that last week I had seen a mouse in the garage, and so he thought that this was the mouse……..but the mouse I saw had already been caught in our mouse trap, which he didn’t know, and that mouse was history. This new mouse was just a tiny baby. 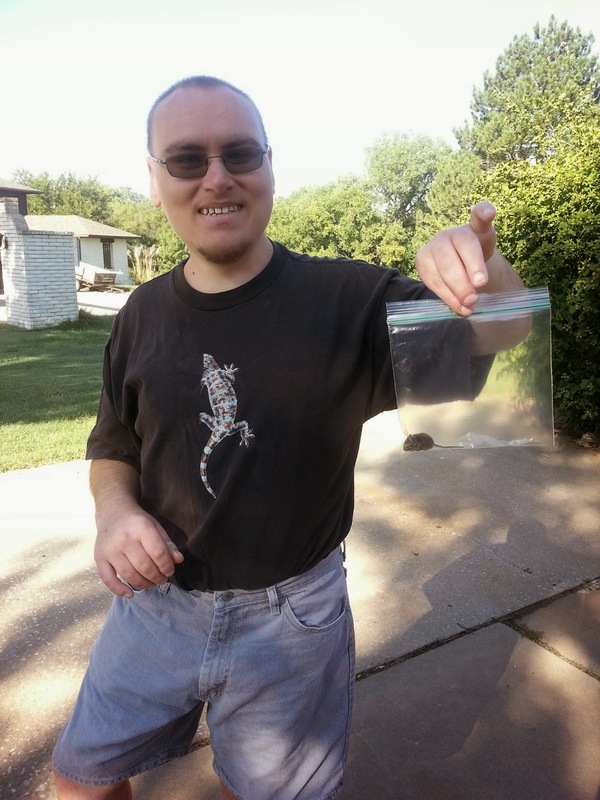 Aaron said he found him just outside the garage door, so he used a stick to put him in the baggie. Aaron was quite proud of himself for finding the mouse. He held up the baggie and I could see the little fellow crawling around inside the bag. Gulp! I let Aaron walk out in the back yard away from the house and let the mouse go. Aaron watched to see if he was moving and when he was satisfied that he was OK, he walked happily back to the house. He washed his hands and off we went to meet his group, and to talk about mice and anything else that came into Aaron’s mind. Aaron, whom as you know is very blunt, has said several times that he wished Gary and I had not come home and that Zach was still here. This doesn’t hurt my feelings. In fact, I’m very glad that Aaron had so much fun with Zach and that Aaron adjusts well to being with someone else other than us. I also wish that Zach had been here this morning so he could have handled the mouse deal. Why did that have to happen on my watch?! It’s good to be home, though……….mouse and all! I’m sitting here thinking of our weekend and thinking of our children. Sometimes I still wonder where the time went. Our three kids are all adults now. We watch Andrea and Andrew from a distance now as they live their lives. They both live hours away from us, and while that can sometimes be sad it’s also very fulfilling for Gary and I to see them so happy in the lives that God has given them. 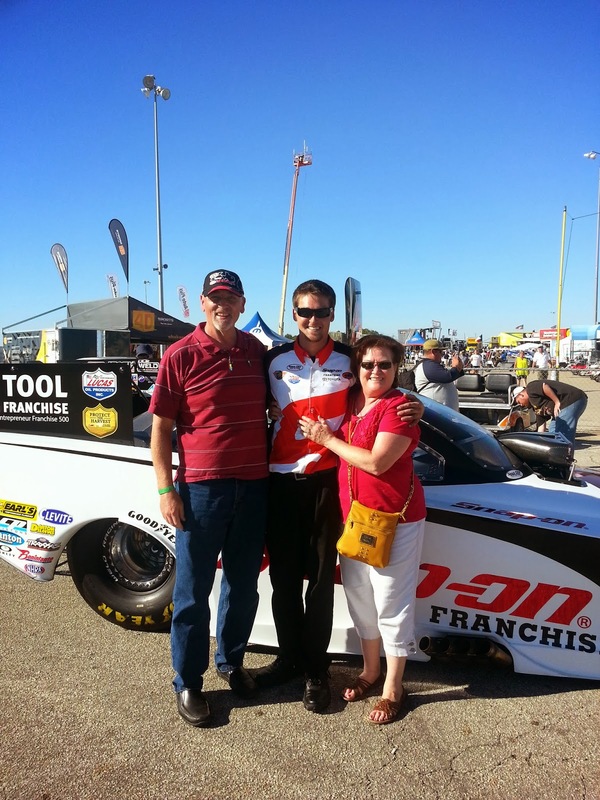 Andrea is in graduate school studying genetics, and Andrew was recently hired by Cruz Pedregon Racing as a member of the pit crew. Aaron, of course, still lives at home with Gary and me. Even when he may someday move out of our home, he will still be under our close care and supervision. Such is life with a child with special needs. Thinking back on the years of raising our children, it seems that times with Aaron stick in our memory the most. With Andrea and Andrew, we had all the typical home schooling and life activities………..music, sports, friends, church. With Aaron, we started out with those things but as time went on, he became less and less interested. Life for Aaron became harder instead of easier. He had such a difficult time with making friends or with wanting to be involved in outside activities. Or sometimes he wanted to be a part of a normal life but he just didn’t know how to do that, or simply couldn’t meet the expanding expectations of a person who is supposed to be growing into adulthood. It’s hard for family life to be normal when parents are trying to manage and understand an issue as complex as autism. Throw epilepsy in the mix and it becomes very muddled. We had many frustrating days when Aaron was a teenager and then in his early twenties. One issue that kept coming up was jealousy. It was sad for Aaron to watch his siblings move on with life while he was stuck with doctors and medicines and surgery and hospital visits. Yet in many ways Aaron took it all in stride, even enjoying the time and attention that these events afforded him. 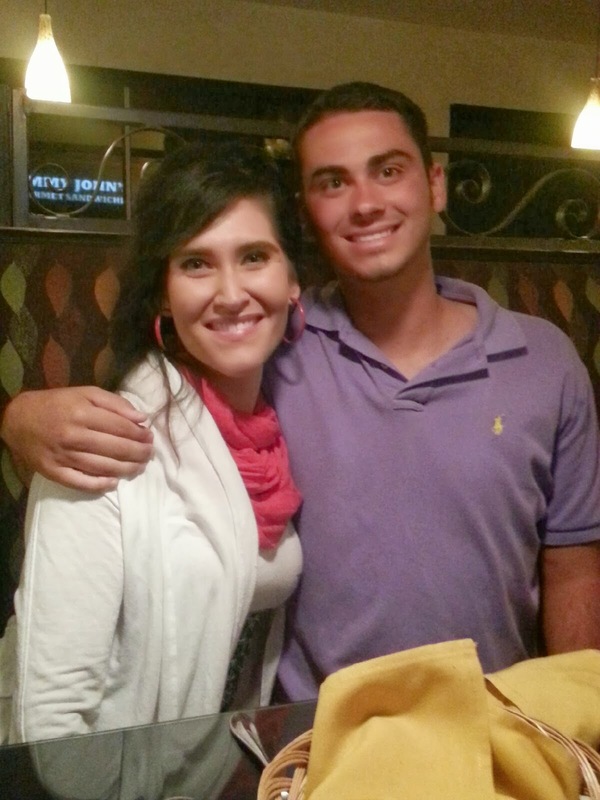 Aaron has always had a special relationship with Andrea. First she was his buddy, his special friend and playmate when they were younger. Now he looks to her as a mother figure in many ways. He misses her since she’s moved away, and often asks, “Mom, when is Andrea coming over?”……….as if she only lives a few blocks away and just comes over every now and then. She and I were on the phone the other night. Aaron walked in the room and when he realized that I was talking to Andrea , he wanted to talk to her as well. I put the phone on speaker and off went Aaron, bending over and rubbing his hands together in delight as he nearly yelled. “Andrea! Is there such a thing as deadly mutant viruses?! !” No “Hi, Andrea! How are you? I miss you.” We would faint if he ever expressed such emotions verbally, but Andrea and I both through our laughter knew that Aaron was happy to talk to his sister. 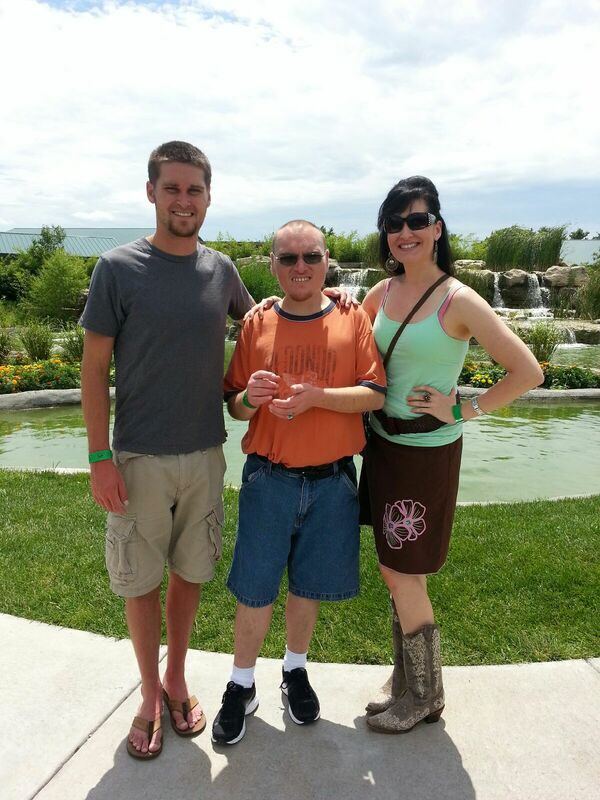 We had some good times with Aaron this past weekend…….just normal life but things that Aaron enjoys. He went for a haircut and even got a shampoo…….something he’s never done before and which delighted him a lot. 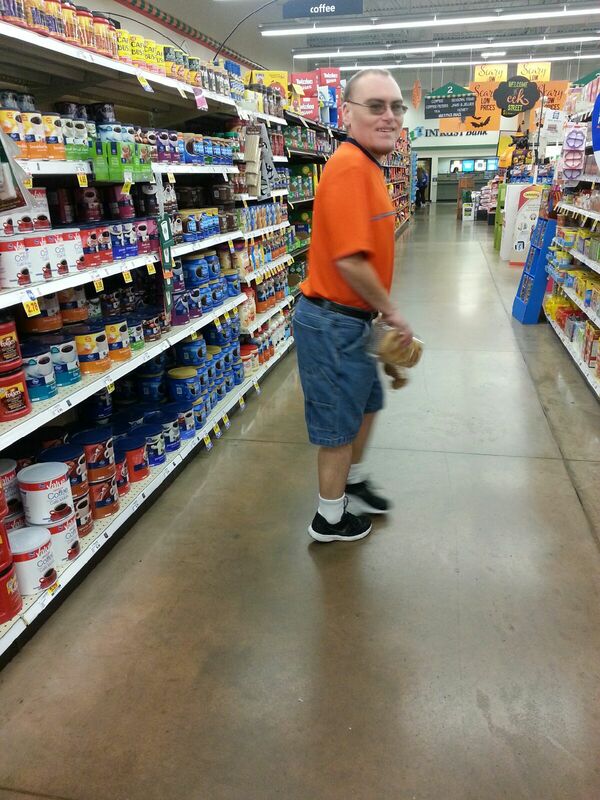 We went to Dillon’s afterwards for him to get a Cheddar Pasta Salad and some of his favorite jelly beans. He ate dinner with Gary and me, talking between bites of his pork chops and fried squash that he loves. We played Tri-Ominos and we watched Wheel of Fortune. He ate some pizza, and then on Sunday evening he tried a new dish at Taco Bell as well as his tried-and-true hot fudge milkshake from Sonic. He talked our ears off, as always, and he did his quirky things that make Aaron…..Aaron. Like putting his peanut jar in his ever-present bowl on top of a plate, and then eating the peanuts out of the jar inside the bowl on top of the plate. That is SO Aaron! And he found my restaurant coupons that I’ve told you about…….the ones that I don’t want him to cut……….and that I found all in a pile……….CUT ON THE DOTTED LINES!!!! Oh, Aaron. In the midst of life with Aaron, we enjoyed hearing about Andrea’s research and her time on Saturday with her boyfriend Pete and his parents. 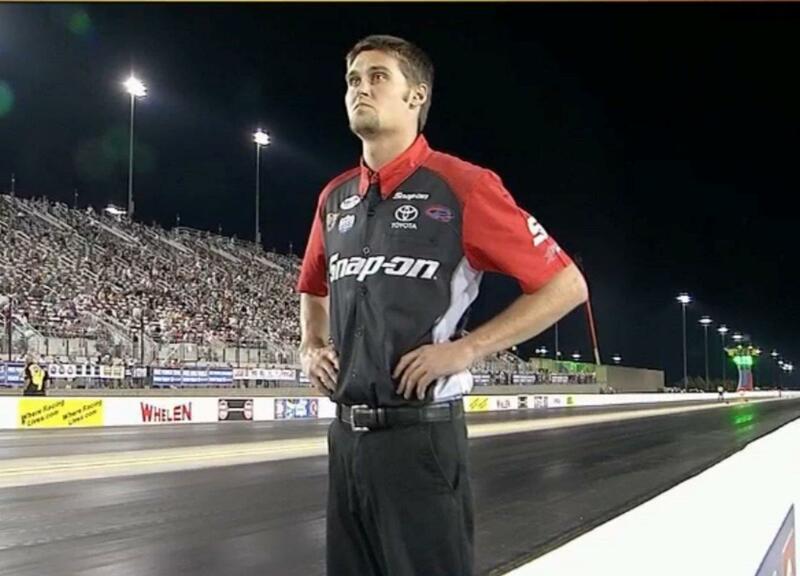 We also got to watch the NHRA race from Charlotte, and to see Andrew on television. This part of Andrew’s life now is something that we’ve tried to downplay in front of Aaron, but he found out about Andrew’s new job and the fact that he’s on TV sometimes. Aaron has seen Andrew on the screen. Aaron didn’t show much reaction to it the first time. This past weekend, he again saw Andrew and he again didn’t act excited……but I did hear him at one point mutter, “So what?” Oh boy, I thought, here we go. There it was, that old green monster of envy coming out. The next morning, yesterday, Aaron was talking to me as I got my make-up on and he said, “You just like watching Andrew on TV. And you just like talking to Andrew when he comes home.” I tried to explain to Aaron how little we see of Andrew and how happy we are for him, and that we do enjoy seeing him on TV. But I also reminded Aaron of the time spent with him and the love that we have for him, wondering if any of what I was saying was penetrating his hidden heart. I thought of how I walked into Aaron’s room over the weekend and tapped him on his shoulder to tell him that we could play Tri-Ominos. He looked up at me with his headphones on as I sat on the bed right beside him. He made very direct eye contact with me, and with warmth and feeling he said, “Mom. I was waiting for you.” Something about his look and that comment just went straight to my heart. Yes, Aaron, I will bring you a knife……AND a fork……AND a spoon. Even though you do NOT need a knife……..or a fork……..or a spoon……… while eating pretzels. But I didn’t remind him of that fact, because I know that Aaron DOES need a knife and a fork and a spoon, for some reason that we cannot quite understand but that we accept. It’s just another way to demonstrate to Aaron that he is loved and that he is accepted. I hope that he sees that and feels it in his heart as he gobbled down the pretzels……..and never touched his knife or his fork or his spoon. But they were there, within reach…….and so are we. Gary’s military career took us to many places over the years. Many of our family were able to come visit us in the various places that we lived, including Germany. 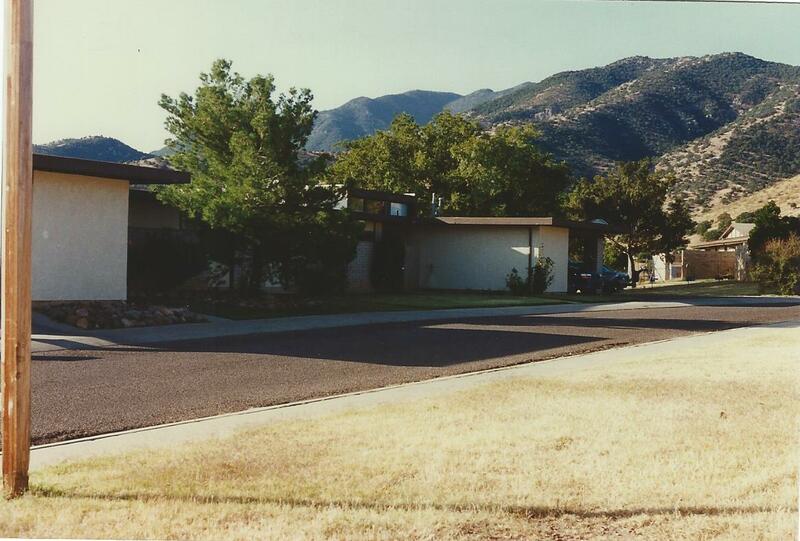 Fort Huachuca, Arizona, was our last assignment before Gary retired. 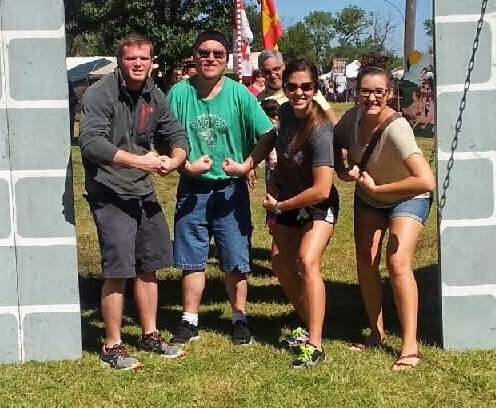 We had lots of family and several friends that were able to come and spend some time with us while we were there, but one trip will always stand out as the trip like none other……….the trip that no one would want to re-live. My mom and dad came out to see us in October of that particular year. October in Arizona is usually a great time to travel because it’s not too hot and not too cold. Since Dad didn’t like to fly, they drove for several days across country, all the way from southern West Virginia to southern Arizona. Mom and Dad enjoyed traveling, so the long drive didn’t bother them. They had decided to just take their time and enjoy each day. Now my mother, years prior to this trip, had been diagnosed with a very rare form of colitis. She would go for rather long periods of time with no problems, and such was the case before they left for this long vacation trip to Arizona. She had been fine, so she didn’t even think about bringing any of her prescription medicine. However, on the long drive across the country she began having problems with her colitis. As soon as they arrived at our place, later that evening, Mom pulled me aside and told me that she would need to go the emergency room the next day to be checked and to see if she could get some of her medicine. It really wasn’t a big deal, she assured me, and so I wasn’t alarmed. 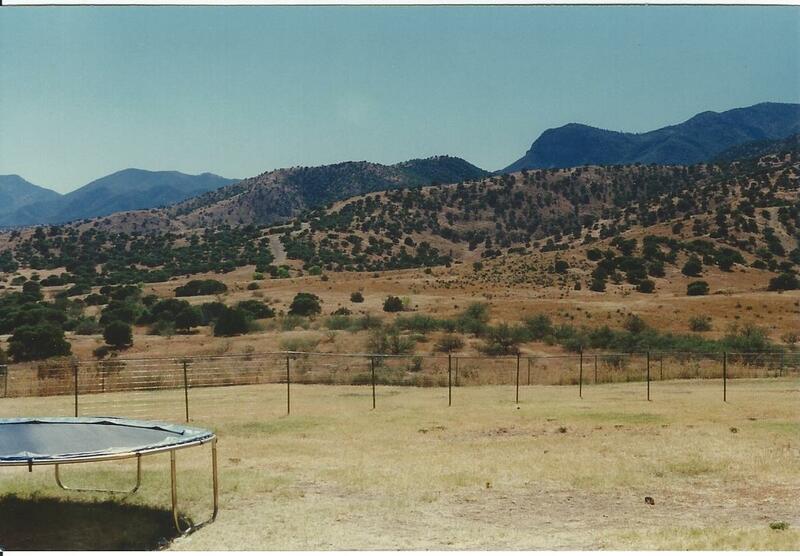 The following day, I took her and Dad to the ER in the town of Sierra Vista. She was examined and plans were made to get her unusual prescription filled there in town for her rare form of colitis. This would take some time, though, so in the meantime the doctor gave her something else to take. In addition, they noticed that her blood pressure was high……….so the doctor said that she would need to come back the next day to have that checked as well. 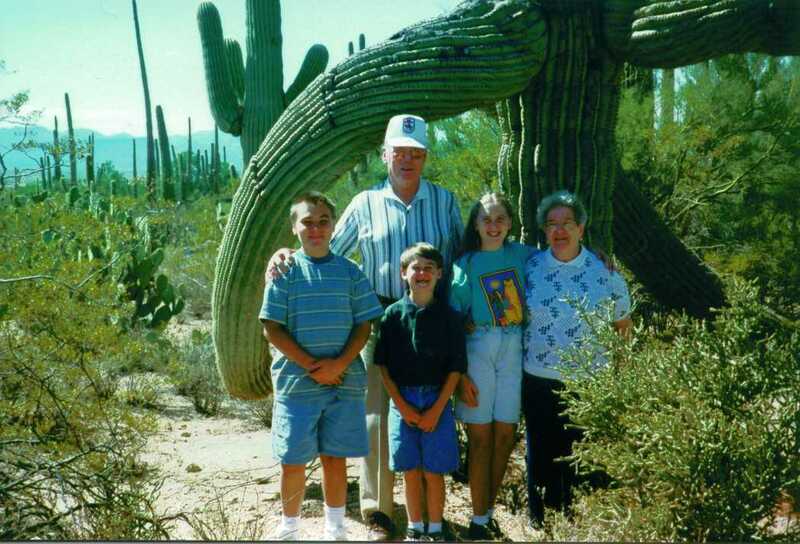 Over the next several days, we juggled Mom’s ER visits with our day trips around southern Arizona. There is so much to see and do there, and they didn’t want to waste a minute. Mom’s colitis, though, was not getting any better but was actually worsening. And her blood pressure was still an issue, so back and forth we would go to the ER to have her checked. We were also dealing with Aaron’s seizures and behaviors……but despite it all, we were having a great time as we saw the sights and went on picnics and enjoyed time together. 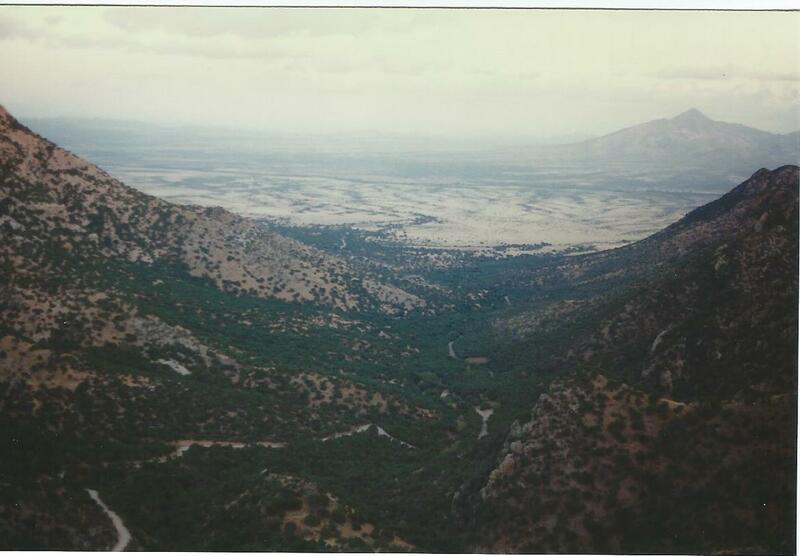 One day I drove us all up through the Coronado National Forest. We ended up at the top, at Montezuma Pass, where we looked out over the gorgeous view. On the way back to the van from the overlook, there was just a tiny little incline with very small rocks on the ground. Dad usually took hold of Mom’s arm to help her in an area like that, but this time she had gone on by herself. Before we knew it, she slid on those tiny rocks and fell down. We rushed over to help her up, and she assured us that she was fine………except that her lower leg hurt. As we drove down off the mountain, I heard her tell Dad that her leg really hurt and that she thought she should go back to the ER to have it checked. Now Dad, who was the sweetest husband ever, proceeded to tell Mom that her leg was fine and that she did not need to go to the ER. At this point, they had been to the ER so many times that some of the staff knew them by name. Dad was hoping that their ER days were over, but it was not to be. As soon as I dropped the kids off at our house and left them with Gary, I drove Mom and Dad back to the now very familiar emergency room. Dad and I waited while Mom was X-rayed…….and then we were both shocked when the doctor walked out to tell us that Mom’s lower bone in her leg was broken. Broken? Are you sure, we asked? Yes, we’re sure, he answered. So Mom’s leg was put in a splint, and we were instructed to be seen by a certain ortho doctor on Monday. This was Friday, so we had the weekend to wait. And now Mom couldn’t walk……..and her colitis was bad, which meant frequent and VERY fast trips to the bathroom. Oh dear. We also, for some reason that I have forgotten, could not get a wheelchair at that time. So we would put Mom in Gary’s desk chair with wheels, and we would roll her quickly around our quarters to the bathroom when the need would hit…….which as I said, was often. VERY often. We also had another little complication on this ever more interesting vacation trip. Remember that we lived in military quarters. When the housing authorities decide to make repairs on your quarters, they don’t typically ask if they can make said repairs. They TELL you when they are making the repairs, and you deal with it. Before Mom and Dad’s trip, we were told that there would be a certain project that would start on such and such a day on our house. Just a small project…………putting on a new roof. Oh, and since they were fairly certain that there was asbestos in the old roof that would be removed, we would need to make plans to be gone from our house on that day. Gone…….as in gone ALL day……so as to avoid the asbestos. You can probably guess that the day of the roof removal was on that Monday……….the Monday that Mom was scheduled to go get her broken leg put in a cast. I had planned a full day trip to Mexico for all of us so we could do what the contractors told us to do……..which was to be gone………..and so we could avoid the nasty asbestos……….and so we could show my parents Mexico and we could shop and we could eat and we could have so much fun. Instead, we were trapped in our house with Mom in a rolling chair with her leg stuck straight out, careening up the hall like crazy people to take her to the bathroom……and contractors at our door bright and early, asking us when we were leaving. I explained that we were NOT leaving, and these Mexicans were trying to understand until they saw Mom……….and then they knew. So they instructed us to keep our windows closed and good luck. Dad and I got Mom to the doctor, and she came home with a nice new cast…….and still with her colitis, as strong as ever. I don’t even remember how high her blood pressure was at this point, but I’m pretty sure that Dad’s and mine was right up there with Mom’s. At least now we also had a wheelchair, and so life was a little easier……..except that our quarters weren’t exactly big enough, especially the bathroom doors, for a wheelchair. Boy oh boy! The Mexicans were working on the roof and we had our windows closed, but we noticed the dark clouds that were rolling in over the mountains. Surely not. It couldn’t be threatening rain in Arizona in October. Not with our roof off………not with Mom in a wheelchair and a cast. Soon our doorbell rang, and one of the Mexican men stood there rapidly firing off his mixture of Spanish and English. I knew enough to know that he was telling me that they were hurrying as fast as they could to beat the rain, but that most of the roof was still not rain-ready. And as we stood there, they also told us to move our vehicles because they were spreading tar on the flat roof………and the wind was whipping up because of the approaching storm. So now we had very little roof and we had blowing tar. Yes, blowing tar. The tar didn’t get on our vehicles that we moved, but it blew all over our yard and carport……..and it seeped into our storage room………..and it got tracked all over the inside of the house. Then the rain came………a hard, blowing rain. The workers all left………..and we were left with drips coming out of our ceiling all over our quarters. We used trash cans and buckets and bowls to catch the water. Which meant that now we had Mom with a broken leg in a cast and with colitis………bad colitis, remember………being pushed quickly up the hall to the bathroom while dodging buckets and bowls and trash cans……….and somehow making it with our help to the toilet. Soon after this rain fiasco started, I heard Mom in the bathroom laughing. There she sat on the toilet, with steady drips of water landing right on her head. Well, at least it was one drip that didn’t need a bucket. We just kept the toilet lid up to catch the drips, and handed Mom a towel to hold on her head whenever she had to go. The next day the workers returned and I tell you no lie………the same thing happened. It rained yet again! We had to laugh at this point. I was so thankful for Mom and Dad’s good attitude, especially Mom’s. Dad was getting a little stressed, of course, as he worried about her and wondered how on earth they were going to get home to West Virginia. Finally, the decision was made. My sister, Jan, flew out to Arizona in order to ride home with them. I picked her up in Phoenix, and on the drive down to Fort Huachuca she asked if I could stop to let her use the bathroom. On down the road a short way, she asked me once again to stop. When she got back in the car, I asked if she was OK……..and she sheepishly said that her colitis had flared up. OH NO!!!!! She made me promise not to tell Mom and Dad, and she said the next day that she was fine……….and off Mom, Dad, and Jan went to drive back to West Virginia. From what Jan told us, the drive back across country was pretty much a nightmare. One day she told me that she stopped counting at 27 the number of times they stopped for Mom’s colitis attacks. Many bathrooms were not wheelchair accessible. Some hotels didn’t have any handicap rooms available. It took at least 5 days to get home………..maybe more………..neither of us can remember. I do know that Jan said by the time they got home, Dad was totally exhausted and he looked grey. Poor Mom was wiped out………pardon the pun, but she would totally love that. But things were not over. Nope, not by a long shot. When they got back home, Mom ended up in the hospital with pneumonia! Yes……..colitis, broken leg, and now pneumonia. 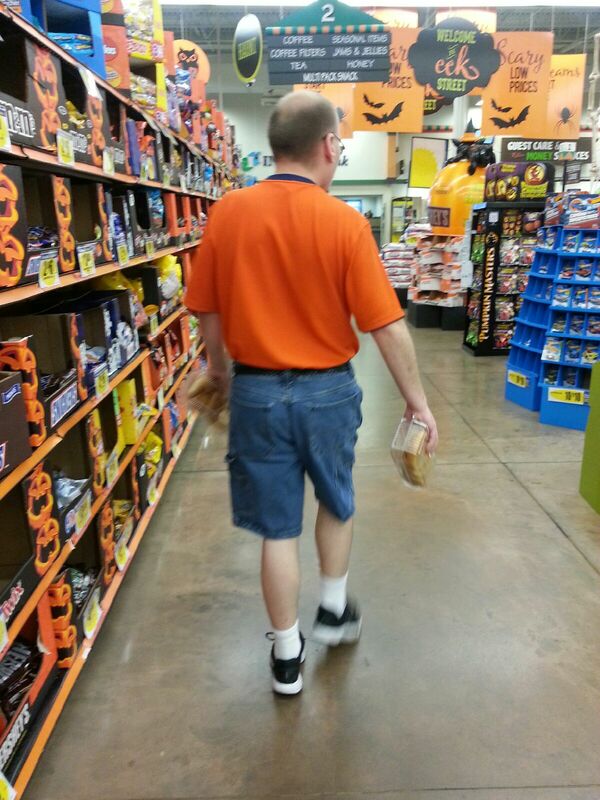 But wait……….there’s more. 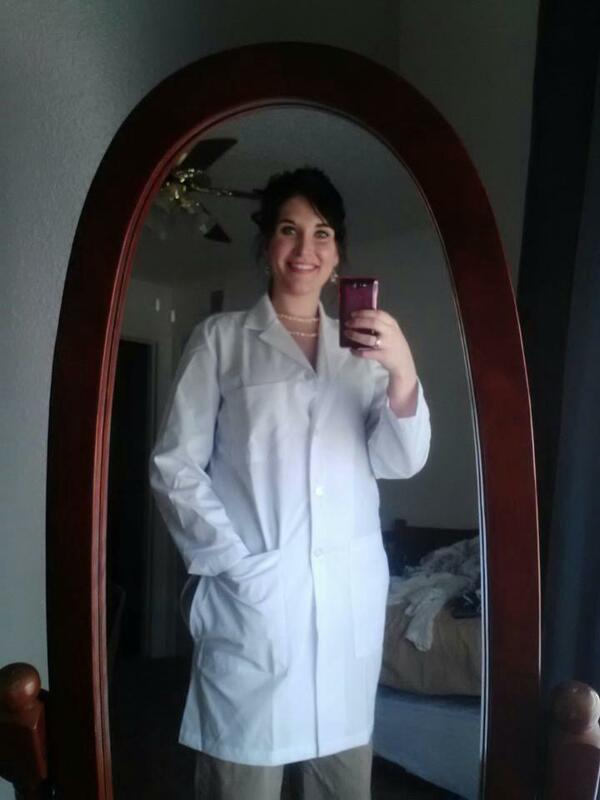 While in the hospital with pneumonia, she developed a blood clot and had an embolism. She was in the best place for that to happen, although it was still a miracle that she didn’t die. Of all things, this was her second embolism. She had one years earlier after toe surgery. She must be some sort of statistical miracle for sure! This long story is just to show that through it all……….through this absolutely horrible vacation……….Mom and Dad stayed calm and strong. Especially Mom. Her strong will and her sense of humor kicked in, and she never acted like she was down or distressed. She joked about everything and made the whole situation easier. And most of all, as she lay in that hospital bed after the embolism, she said that God comforted her by giving her the verse that became her verse. I wrote about that verse yesterday. Psalm 46:10 – “Be still and know that I am God.” She said she lay there and just let her mind dwell on that verse. She knew that God was in charge of all this craziness, and in charge of her health………..and that if she died, it would be fine………..and if not, then she would remember that He is God. Tomorrow is Mom’s 87th birthday. She has Alzheimer’s and has forgotten more than she remembers now. I bet she can’t remember that disaster of a vacation…….and maybe that’s best. But I’m thankful that the rest of us can think of it and remember what a testimony she was through it all. We love you, Mom! And we think of what you always said when you had these colitis episodes……”It’ll all come out OK in the end.” HaHaHa! That’s my Mom! Author hesaidwhatksPosted on September 13, 2013 May 29, 2017 Categories Dad, Family, Humor, Mom, Patience, Peace, Pneumonia, Travel, Vacation1 Comment on Are We Having Fun Yet? Two or three weeks ago, on a Sunday, I was having one of those days when my mind kept going to some incidents in our past…….hurtful, unresolved affairs that I find myself dwelling upon more often than I should. Much in the same way that I need to redirect Aaron on a bad day, I find myself at these times in need of redirection. But when it’s me trying to redirect me, it just sometimes doesn’t work out so well. If I’m not careful, I will become mired in my negative thoughts and in re-living all the events and feelings once again. All the hurt and pain come bubbling up to the surface, not benefiting me one bit and not at all what the Lord wants me to be doing. On this particular Sunday, as soon as my mind started down that familiar path, the Holy Spirit spoke to my heart in such a clear way that it was almost as if I heard an audible voice. He spoke God’s Word to me……..one simple verse that happens to be my mother’s favorite verse. “Be still, and know that I am God.” (Psalm 46:10a) This verse kept going through my mind on that early Sunday afternoon. As soon as I could, I went to the desk where I keep my Bible and my study books. I looked up the word “still” and I was very blessed by what I found. I know that my NIV Bible says, “Cease striving and know that I am God.” That’s a correct translation of the phrase “be still.” But what I saw first as I looked in my concordance under “still” was the word “slacken.” Instantly my mind went to the game I played many times on the playground at Knob Elementary School when I was a young girl. We would take a rope and choose teams, and then play Tug of War. We loved that game! Each of us would take the rope and then pull with all our might against the pulling of the opposite team. We were determined to win, and the only way to do it was to keep pulling and tugging. Letting go or letting up was not an option if we wanted the victory. The tug of war I find myself in now, though, is quite different than the game I played as a child. I am actually in a tug of war with God whenever I pick up that rope of my hurts, curl my fingers around the rough rope, and beginning pulling. But there is no winning for me as I pull with all my might. The more I think of my hurts, the harder I pull on that rope……….and in the process, the more defeated I am actually becoming. God is on the other side of the rope, holding on with all His power………just waiting for me to slacken my end…….to quit struggling and pulling in this losing game. In my Bible I have a note by Psalm 46:10. I have written: “Take your hands off.” Yes, there it is again…….that reminder to slacken the rope……….to loosen my grip…….to take my hands off. And there is God, on the other side of the rope, waiting to pull me to Himself and to take me in His arms, reminding me of His might and His love. I wish I learned these lessons the first time, but I don’t. I may slacken my grip on my thoughts and let God take over, but don’t you know it’s not long before I repeat the process…………over and over again. 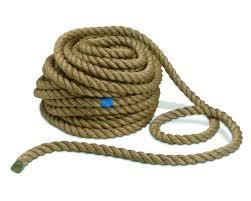 Every time I start reviewing those hurts, I am picking up the rope. Every time I start worrying about my children, I have bent over and am putting that rope in my hands. Every time I become focused on the culture and the political climate, worrying about where it will all lead, I am curling my fingers once again around that rope. Every time I question why God isn’t seeming to answer my prayers, I am jamming my feet into the ground and getting ready to pull. What God wants me to do, however, is just the opposite. When the worries and the thoughts and the hurts crowd my brain, and I bend over to pick up that rope, He wants me to instead just let it slacken. Ease my grip, let the rope fall, and run to Him in prayer and reading His Word and dwelling on Who I know that He is. This verse says, “Be still (slacken that rope!) and know that I am God.” That’s all. Know that He is God. That’s all I need to know………and that’s plenty, if I really stop to think about it. In the knowing comes the trusting, because I do know that He can be trusted with all my worries and hurts and pains. It’s time for me to put that trust into daily practice……..to slacken my hold on that rope………to take my hands off……..and let God win. And in the long run, when God wins, I win. Every time. When Aaron has an ache or a pain, it becomes the center of his conversation and his thoughts. He also thinks that it should become our main focus as well, and he does everything in his power to see that it does just that. Of course, Aaron’s main power is his mouth……..so he talks and talks about his ache or his pain until he himself has become a regular pain……to us. It can be quite an interesting circle in which we find ourselves. For instance, Aaron’s leg. He bumped his leg on the van at his day group, so he says, and it must have really been painful……..at least to hear him tell it. There were two little open scrapes, too, so band-aids were needed – as was lots of sympathy. I gave sympathy until I was blue in the face, and still he talked and talked and talked about his poor leg. I assured him that his leg was not broken, because he was sure that it was, and that the bruising would heal as would the scrapes. But Aaron is not one to let go of a topic too easily. “Mom,” he said. “I hurt my leg. When I walk it’s like I bend the bruise.” And he waits for the appropriate sympathetic response. “Mom,” he said another time. “My leg hurts. It’s like the sore has been spread up.” And he waits once more for the sympathy that he hopes is coming. “Mom,” he continued yet again. “Did I break my muscle?” And he doesn’t even notice my sigh as he looks yet again for his mother’s soft sympathy. But the sympathy from mom is not as heartfelt and sweet now, he notices. Mom is more to the point now and doesn’t even stop to look at the hurt leg. So he tries another tactic. “Mom,” he blurted out. “I hate my body!” And with this, Mom’s head jerks up and she looks alarmed. Ah, Aaron thinks……….I got a better response with that one! And Mom very nearly took his leg part apart in order to hit him over the head with it! But Aaron didn’t know that, thank goodness, and after a little, partially sympathetic talk he was once again happily assured that Mom did still care about his pathetic leg. I was very happy when his leg was better and wasn’t the center of Aaron’s universe. However, this morning Aaron said that he threw up some. He also threw up a little yesterday morning. He seems fine and I suspect it may be from all the peanuts that he’s eating at night when he reads before bed. Whether he really threw up this morning is a mystery because I didn’t see it. The fact that it’s Monday and that he has to go to his day group may be more a motivator to him than anything. The throw-up card could come in handy in order to be able to stay at home. And so began his list of symptoms, beginning with the throw-up. I know, Aaron, but here’s your coffee and I’m sure that will help you feel better. I know you threw up, Aaron, but I bet that after your shower and your coffee you’ll start feeling much better. Aaron, those are skin tags and many people have those under their arms. Nope……skin tags. So Aaron disappointingly headed for the shower, returning several more times to talk. I finally asked him if he wanted to stop at Dillon’s on our way to meet his group. He could get something to take with him to eat, I told him. I could see that Aaron was very interested in that prospect, so off he went to take his shower. Having something else to think about rather than throw-up and headaches and skin tags was working wonders. I felt like we were out of the woods when, after his shower, Aaron stood in my bathroom and talked non-stop about clone armies, Republic Commando, squads……..and then moved on to mutated viruses of various sorts. But there was no talk of his various ailments or that he was too tired to go to Paradigm, and I felt that we were almost over the “I don’t want to go today” hurdles. Some people may call it bribery, but I still always remember what Aaron’s wonderful teacher, Tom, used to say……”Sometimes you have to make it worth their while.” Sometimes re-directing Aaron’s thoughts from his “I don’t want to’s” to something more pleasant is just beneficial to all of us. It may be a cup of coffee, or saying that Jackson can ride in the van with us, or a stop at the store on the way to his group that will help Aaron to turn the corner and to quit obsessing about himself. “What, Mom?” he replied. “You don’t want me to be Hercules?” So for two aisles we discussed why Aaron was not Hercules and why I didn’t want him to be Hercules and why couldn’t he be Hercules……..as he grabbed two containers of his favorite croissants and a Gatorade and we stood in the self check-out line, where he gave me a little whack on my behind. Aaron, stand here and bag your food. And no, I do not want you to hit me there. And don’t ask why again because you know why. Aaron, come here and finish bagging. Aaron, don’t back up into that person behind you. Yes, those skeletons are there for Halloween. Don’t back up! Here, bag your Gatorade! No, don’t take the bags yet. We’re not finished. Aaron, where are you going? Sigh. Dillon’s seemed like such a good idea when we were at home. I grabbed the receipt and quickly followed Aaron out the doors, thankful that both of his hands were full of grocery bags. No Hercules this time! But there WILL be a next time. There always is with Aaron. On Wednesday night Aaron wanted to play a game, like he does every night of his life……and since I was too sleepy to feel like I could stay awake to read a book, I agreed to a game of Tri-Ominos with Aaron. Does that sound self-serving? I also agreed to a game because I do love Aaron, but sometimes I don’t like spending time with Aaron. That may have sounded worse. Well, anyway, some nights I just don’t have it in me, or I really don’t have the time, to sit at the table and play a game with Aaron. Because it’s not just playing a game……….it’s listening to his non-stop talking on most nights about a movie or a favorite game………and listening to him thump on the table with his hand………..and listening to him whistle…….and listening to him clap…….and listening to him slurp out of his water bottle…….. But Aaron can also be very funny and insightful and interesting. I’ve beaten him several times recently in Tri-Ominos, so he was absolutely thrilled when our first game went by quickly and he BEAT Mom 171-25!!!! Of course, he wanted to play again and since we had time and I had no easy way out, I agreed. This second game went by much slower, naturally. His talk of clone armies and squads and drones and I don’t even remember what else was definitely having an effect on me. I could NOT stop yawning and rubbing my eyes. 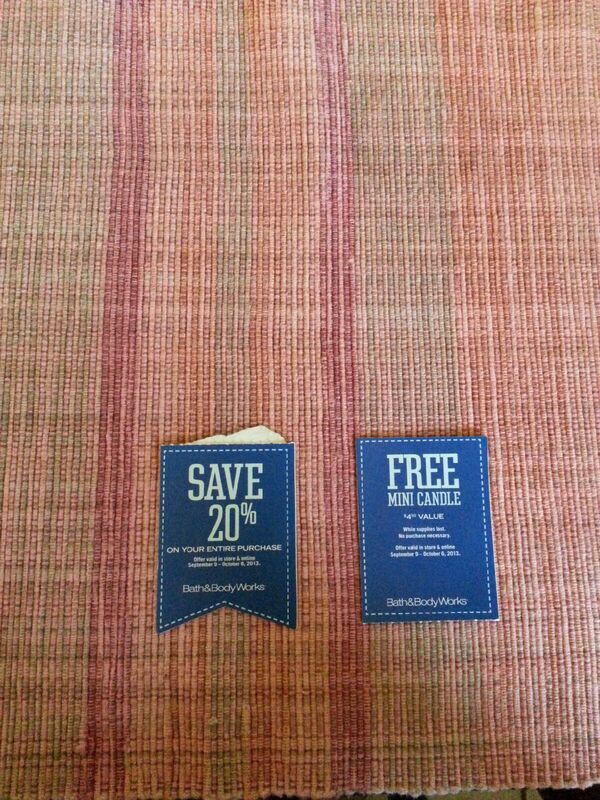 I was in a haze when I saw that Aaron had reached over and picked up my cardboard coupon from Bath and Body Works. It was actually two coupons, with the serrated line between them. I have to explain that Aaron, who clips all of my grocery coupons, can sniff out a coupon from another room. 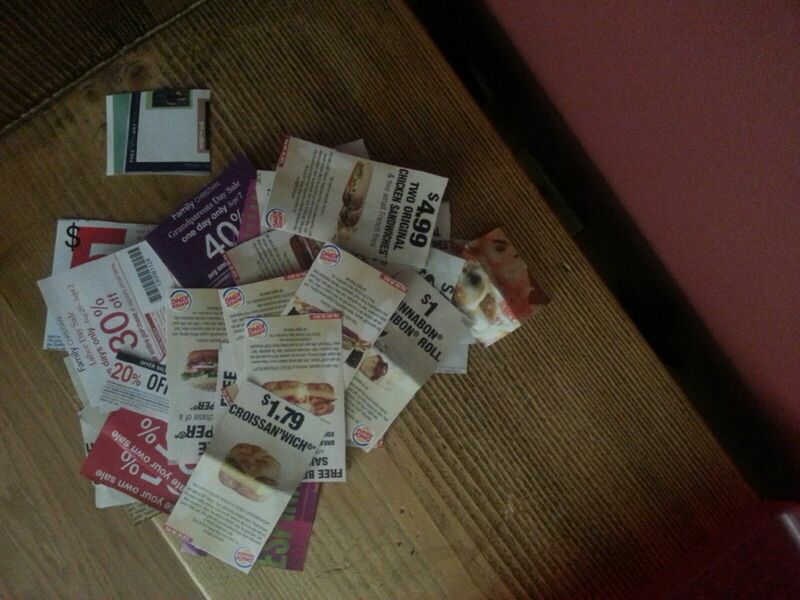 I had a little stack of restaurant and other store coupons laying there on the table. I keep them in a box in the van so I have them when I need them, and I had set these aside to take to the box later. I’ve told Aaron and told Aaron that I don’t want many of those coupons to be clipped. I prefer to store a sheet of those coupons in my box, for instance, instead of having 15 little cut coupons getting lost in the box. Aaron’s radar went right to the Bath and Body coupons with the serrated line that was just screaming at him. TEAR ME APART!………..is what it was saying to Aaron. I looked over at Aaron through another yawn and saw that he held that little coupon strip in his hand, staring down at it with his motive clear. YES, I WILL TEAR YOU APART!……..is what Aaron was saying to the coupons. Now I realize this is no big deal, but you must understand that if you give Aaron an inch, he will take a mile……….clipping everything with lines on it along the way. On Sundays, I have taken out some of the coupons from the newspaper insert that I don’t need in order to lessen his coupon cutting load. But if he finds them, he gets irritated and insists on taking them so he can cut them out. He doesn’t care that I won’t use them. They have lines and they MUST be cut!!! Can you spell r-i-g-i-d r-o-u-t-i-n-e-s? No, Aaron, they don’t HAVE to come apart. But my words did nothing to settle that conflict in his head about the purpose of that serrated line. He thought that Mom was certainly ridiculous to not have torn the coupons apart already, and he was here to set this matter straight. Several more times during our final game of Tri-Ominos I saw him with the coupons in his hands, and each time I told him no……..do not tear the coupons apart. 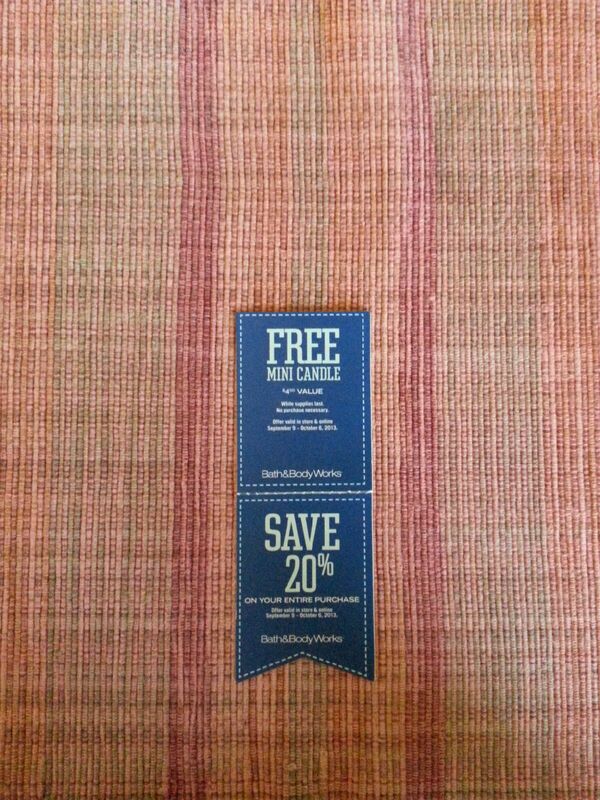 Finally, he reached across the table and handed me the little coupon strip. He knew that the pull to tear those coupons apart was too strong to resist, so he handed me the coupons in an effort to rid himself of this strong temptation. “You just can’t resist tearing the coupons apart, can you, Aaron?” I asked. And he agreed that he could not resist………so there, Mom! Take them! I kept the tempting coupons with me for the rest of the game, out of Aaron’s reach, and when we were through with our game I put them back in the stack of coupons waiting to be taken to the van. The next morning, Aaron got up and soon joined me at the kitchen table. We talked for a few minutes about how he slept and about his upcoming day. I was reading the paper as we talked, absorbed in juggling Aaron’s conversation with what I was reading………….when I heard it. It was the soft but unmistakable sound of something being torn apart at a serrated line. Zzzzzzzip. My head jerked up and there sat Aaron, smiling broadly as he held those little Bath and Body coupons…….one in each hand. He had torn them apart, of course. His smile was not one of meanness, but instead was one of relief, almost. His purpose in life………..for that moment………had been fulfilled. The coupons were no longer tormenting him to tear them apart. The deed was done! The mission accomplished! Of course, I fussed at him and tried to correct him…….all the while knowing that he absolutely could not restrain himself from carrying out the purpose of that serrated line. This is part of the complexity of Aaron. I would say charm, but sometimes it’s anything BUT charming………..although these acts are often amusing as I look at Aaron’s gleaming eyes and big smile. Bingo, I thought! Aaron, most of the time I can’t reach you either! And I have some torn apart coupons to prove it!